other insects. There are approximately 25,000 of its specie are spread all throughout the world. in Origami Bee is Fun to fold. 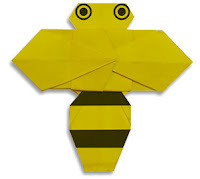 It is suitable for Kids origami folding.